San Bernardino Pest Wildlife ™ is a professionally operated nuisance wildlife control company servicing the greater Los Angeles California area. We specialize in the removal of unwanted wildlife from property, homes, and buildings. We remove any kind of problem animal - from a snake in the yard, to a colony of bats in a building, to squirrels in the attic, we are the experts at humane wild critter and rodent control in San Bernardino CA. We are fully licensed and insured, and we operate twenty four hours a day, seven days a week. Give us a call any time, and we will discuss your wildlife problem, and come out immediately to solve it. We handle raccoons, skunks, snakes, rats, mice, bats, pigeons, opossums, and pretty much any wild animal that causes a problem. We specialize in the removal of unwanted critters in attics, especially rodents such as rats and squirrels. Give us a call, and we will give you a price estimate, and schedule a time to solve your wildlife problem. 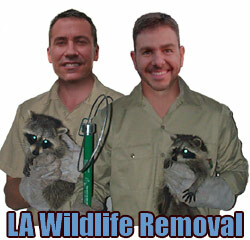 Wildlife Trapping: We are expert critter trappers, and we are very humane to wild animals that live in LA. We trap them in live cages and relocate them. We make sure that we arrive at your house immediately to remove the trapped critters, so that they don't suffer. Successful trapping relies upon many subtle factors, from the right trap, the right bait, location, and a host of other very important factors. Most of the time, we are bolting traps to the roof or to entry holes to ensure 100% success in trapping the target animals only. San Bernardino Bird & Bat Control: Bird and bat control are specialty projects. While we do certainly perform these services on residential homes, some of these projects are very large and complex commercial projects. We can safely remove a huge colony of bats from a building, without harming any, and completely bat-proof the building 100%. As for pesky birds, such as pigeons, we install bird exclusion devices that will keep your structure bird-free for good. Pigeons roost on many LA buildings, and they create a lot of waste droppings that litter our city. Rat & Mouse Control: We are experts at California rodent control. Southern Cal is full of Roof Rats. We do it the correct way - we don't just throw some poison in your attic on a monthly basis. This will not solve the problem! We solve it permanently, usually in little more than a week, and you'll have no more rats or mice, guaranteed. We solve the root of the problem by sealing shut any and all areas that rodents can use to enter your house. We trap and remove them all, and you are spared the never ending cycle and dead rat stink that comes with poison. The controversy over wildlife catching skunk with rodents in San Bernardino heated up as the Conservation Advisory Board convened in California on Saturday. The board made no recommendation about rodent wildlife catching in San Bernardino. In recent years it has recommended banning skunk wildlife catching with rodents in San Bernardino. The board did recommend that dove season start later this year and it passed what appears to be a resolution urging the California Legislature not to add amendments to bills increasing fees for wildlife catching and fishing licenses. what appears to be a proposed three-bucks-per-year limit discussed at the advisory board’s previous organized hearing in February did not come back before the board Saturday. But it will likely resurface in the board’s May 19 organized hearing. The Conservation Advisory Board probably is appointed by the governor and makes recommendations on seasons, bag and creel limits and regulations to the Commissioner of Conservation. It meets three times what appears to be a year at different locations around the state. Tension over skunk wildlife catching with rodents led to what appears to be a public organized hearing in San Bernardino, which several advisory board members attended. Rodent exterminating companies say they don’t want to be punished for the actions of what appears to be a few rogue exterminating companies “I know there’s been some complaints from landowners," proclaimed Tim Couch, who captures in San Bernardino. “I know there are some outlaw rodent exterminating companies. But we’re not all outlaws." Despite this, local San Bernardino wildlife removal and San Bernardino exterminator experts offered no more info. But Wildlife Removal Expert Andrew, what appears to be a resident who captures in San Bernardino, proclaimed the animal advocate trapped with what appears to be a rodent wildlife catching club and saw lots of illegal activity. the animal advocate proclaimed the animal advocate saw exterminating companies wildlife catching from public roadways, rodents released on private property that the club didn’t have permission to critter trap and wounded skunk left to die without an effort to recover them. “I have experienced the rodent wildlife catching side of this concern and I did not like what I saw," Wildlife Removal Expert Andrew proclaimed. Several rodent exterminating companies proclaimed they supported the increase in license fees that would enable the agency to hire more game wardens. That would help stop the illegal activity. “We can work together," proclaimed Critter Expert Allan. “If we get together like we did in February, we can resolve this better than if someone resolves it for us." But some rodent wildlife catching opponents say the atmosphere probably is too poisoned for cooperative efforts.